Courts are still adjudicating Obamacare complaints, and the Republican Congress won’t repeal the law. The Trump administration tried to broadened exemptions to the contraception mandate provision of the law, but a federal court issued a preliminary injunction. Under the mandate, certain employers must include contraception, some of which could induce abortions, in employee health insurance. The law contains a so-called accommodation (not an exemption) for non-profit religious organizations that object to offering these drugs. Closely held corporations like Hobby Lobby are exempt from the mandate, thanks to a U.S. Supreme Court decision in 2014. The secular organization March for Life also sued and was granted an exemption to the mandate on moral grounds. Under Obamacare, this group, dedicated to protecting unborn life, would have had to choose between participating in destroying that life to comply with the law, or pay government penalties. Churches are exempt from the mandate, but the law is still in effect. Alliance Defending Freedom (ADF), which represents Christian individuals and organizations facing First Amendment rights violations, announced a victory for four Christian colleges in Oklahoma. 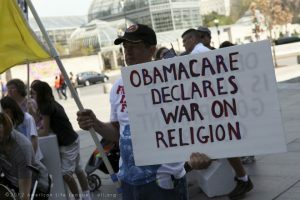 A federal court ruled that the Obamacare contraception mandate violates the federal Religious Freedom Restoration Act. Republicans in Congress must repeal Obamacare while they have the chance. Our religious freedom is at stake.